Let's be clear, it is a massive push to crush Christianity. Not "religion". Islam is not under attack, but is propped up by this government whose President is so Pro-Muslim that many, like yours truly, believe he to is a Muslim. This is a problem that is top down. And at the top of the food chain is Barack Hussein Obama. This is a President that when he recites the Declaration of Independence, he skips the word "Creator" not just once, but over and over again. Weird huh? 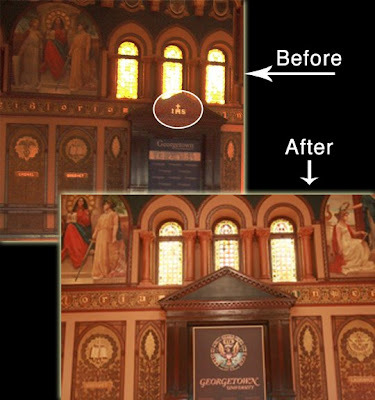 This is a man that when he spoke at Georgetown University in 2009 forced the College to cover a monogram for the name of Jesus that is always displayed over the podium. (Obama doesn't want competition apparently). Obama's public disdain for religion, at least for historic Christianity was displayed in his comments, "they cling to their guns or religion". There are several solid examples that makes a great case towards his disdain for historic Christianity. But I think we can take it a step further. It is much more shocking when we realize that Barack Hussein Obama is a Muslim, with a Muslim background and Muslim roots in Kenya. He is also quite fond of supporting Islam, as in the Arab Spring, the Muslim Brotherhood, etc., and it is my contention that it is because he is a Muslim, wearing a portion of the inscribed "shahadah" on his wedding band which states "There is no god but Allah"
Roman Catholics traditionally use “IHS” as an abbreviation for Jesus’ name. According to the Catholic Encyclopedia, “St. Ignatius of Loyola adopted the monogram in his seal as general of the Society of Jesus (1541) and thus became the emblem of his institute.” This was covered up at the request of the White House. He insisted that public singing, dancing and playing music without a permit is against the Miami-Dade Transit rules. The case is just one of hundreds referenced in a newly updated report by legal experts with the Texas-based Liberty Institute. The non-profit legal advocacy group says the evidence shows the U.S. government is steadily advancing an agenda to replace the “Creator” in the Declaration of Independence with itself. Liberty Institute says the report documents more than 1,200 cases of attacks by the government on the right to free expression of religion through rules, regulations, laws and precedents. The report,“Undeniable: The Survey of Hostility to Religion in America,” recently was updated for 2013, following its initial release in 2012. “What if religion becomes an opinion only to be expressed privately in your home or quietly in your church, if at all? What if religious liberty becomes a poor, subservient tenant of an arbitrary and imperious government landlord?” the report asks. “If that occurs, then government can erase any of your rights as it sees fit, since government, not the ‘Creator’ cited by the Founders, will be regarded as the ultimate definer, giver or taker of all rights,” the report says. The report is a joint effort of the Liberty Institute and the Family Research Council, which a year ago was the target of a now-convicted domestic terrorist who declared he wanted to kill as many people as he could. Floyd Lee Corkins told investigators that he got the idea of targeting FRC from the Southern Poverty Law Center, which routinely labels organizations that support traditional marriage instead as hate organizations. The report divides the hundreds of pages of documentation about attacks on religious freedom in America into three categories: attacks in the public arena, in schools and against churches and other religious groups. Among the current high-profile battles is the dispute over Obamacare’s demand that employers pay for abortifacients and workers pay for abortion services, even if they have a religious objection to killing unborn children. 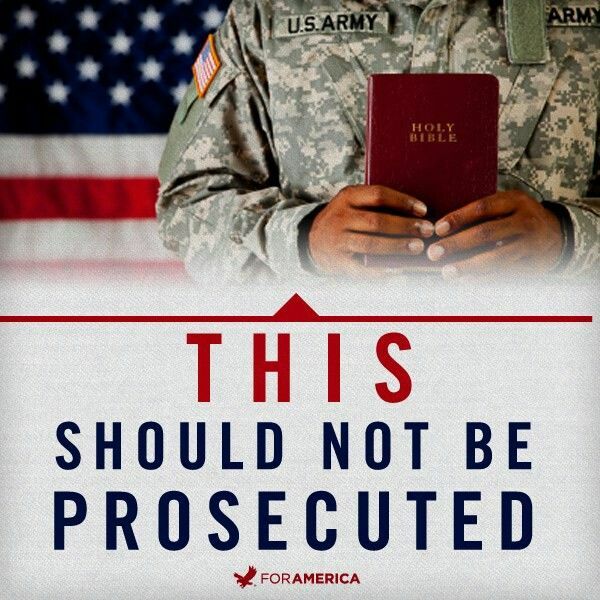 The report says there also are prohibitions on veterans’ memorials, displays of the Ten Commandments and public invocations, such as the pastor who was told he was not allowed to pray “in Jesus’ name” at a Memorial Day event. Cheerleaders were barred from putting Bible verses on banners at football games, a third-grader was told he could not include a religious message along with goodies he was handing out to classmates, and a student wasn’t allowed to say “Jesus” when asked what Easter meant. A church in Holly Springs, Miss., had to fight opposition from city officials to plans for a new building. But the report says “there is hope.” “While [the report] shows that attacks on religious liberty are dramatically increase in the United States, both in the frequency and in the severity of the attacks, this survey also shows that those persons and organizations, like Liberty Institute, that stand up for religious liberty win when they fight,” the report says. “When those who value religious liberty actively engage the cultural and legal battle against secularism, they push back the secularists’ agenda,” it says. While the “tidal wave” of anti-religious activism is surging, there “is still time to turn back this tide.” “In fact, there is encouraging evidence that we can do so if we choose. Liberty Institute and the Family Research Council have joined forces to boldly defend and restore religious liberty in America. This includes opposing and exposing the escalating efforts by activist organizations and government bureaucrats to redefine and regulate religious freedom as conceived by America’s Founders. A long list The 82-year-old Anderson filed a lawsuit to recover for battery, assault and negligence. She also sought an order protecting the rights of future passengers. The governor of Kentucky vetoed a bill to protect sincere religious believers against government overreach and coercion. The report says: “Opponents vilified religious believers by spreading offensive and invidious message. A gay, lesbian, bisexual and transgender advocacy group labeled religious protections an ‘endorsement of discrimination,’ placing ‘women, children, people of color and all Kentuckians’ at risk. Among the other cases in the report: A pastor in New York won the right to hold a Bible study in community center that had banned “religious” events. A church in Dallas was ejected from an empty high school where it had been holding Sunday services, even they the church had a valid lease. The city of Plano, Texas, tried to prevent WillowCreek Fellowship Church from opening because of the angle of the roof of its church building. An Ohio library ordered a Christian group not to meet there to talk about traditional marriage, unless advocates for homosexuality also were present. An African-American church in Texas was billed for property taxes after its building burned down. The assessor’s argument was that members no longer could meet on the property, so it no longer was tax-exempt. The NFL threatened churches showing the Super Bowl on their big screen televisions. A church in Brookville, Pa., was fined for opening its parsonage to three homeless men to live there. A minister’s invitation to the National Prayer Luncheon was revoked because he was critical of open homosexuality in the military. The city of Cheyenne, Wy., denied permission for a non-profit organization to run a daycare center.